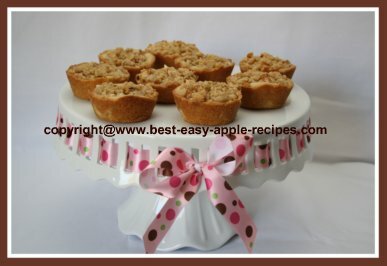 The Blog for All Recipes with Apples! 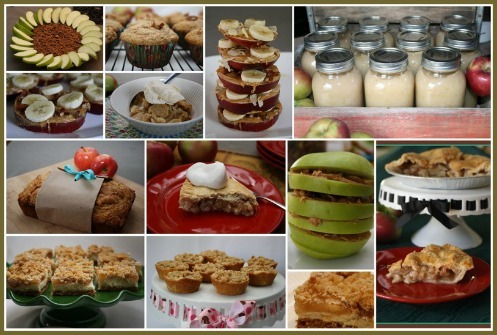 By keeping an eye on my Blog, you will never miss the latest apple recipes and apple tips. To subscribe to my Blog (no e-mail necessary), right-click on the orange RSS button (above) and then paste the URL into your RSS reader. Why not like "Apple Recipes" on Facebook too - see right-hand column, (or scroll down for mobile view), and receive updates via Facebook! This Crockpot Applesauce Recipe is a great way to make delicious sauce with apples using the Slow Cooker, using sugar or sweetener for diabetic diets. 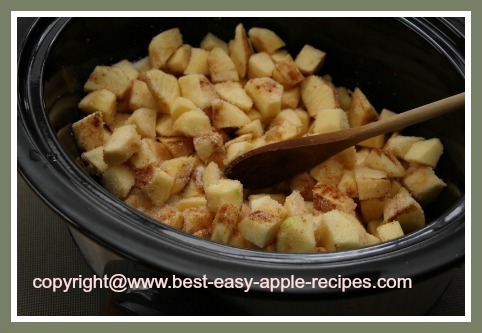 Continue reading "Crockpot Applesauce Recipe - Make Applesauce in the Slow Cooker"
Best Apple Recipes - Hundreds of Recipes with Pictures for how to make easy apple pies, crumbles, muffins, cake, applesauce, apple dessert recipes, smoothies, salads with apples, and more! 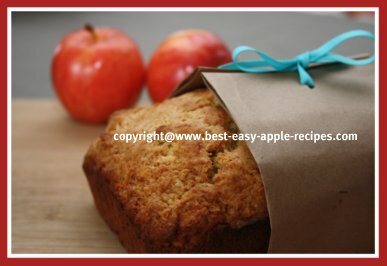 Continue reading "Apple Recipes - Best Ideas for Recipes to make with Apples"
An Easy APPLE LOAF Recipe with Nuts to make a delectable apple bread for brunch or snack time.This is a yummy quick bread apple recipe for apples that does not need yeast! Continue reading "Homemade Apple Loaf Recipe - Easy Apple Bread with Nuts"
This Recipe for Apple Fritters with raisins makes the BEST DUTCH OLIEBOLLEN ever, just like fried apple donuts, the Dutch traditionally make these amazing Oliebollen on New Years!. 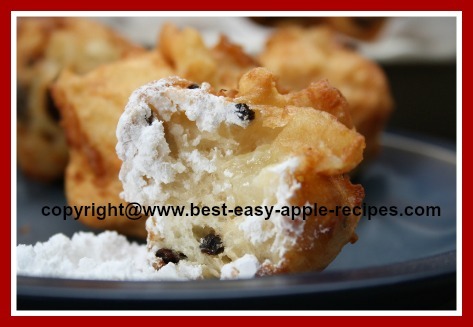 Continue reading "Recipe for Apple Fritters - Best Dutch Oliebollen Recipe"
Instructions for STORING APPLES for the winter, tips to keep apples fresh longer. Continue reading "Storing Apples - Best Way to Store Fresh Apples over Winter"
These Healthy Cranberry Apple Bran Muffins are a great idea for a recipe for breakfast muffins with high fibre, bran and fruit. 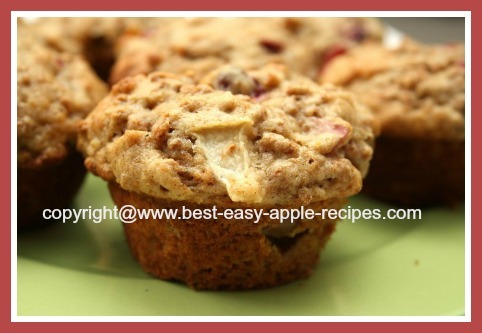 Continue reading "Healthy Cranberry Apple Bran Muffins Recipe-Idea for Breakfast Muffins"
This APPLE TART RECIPE makes scrumptious tarts with chopped apple and a streusel topping that are EASY AND QUICK! 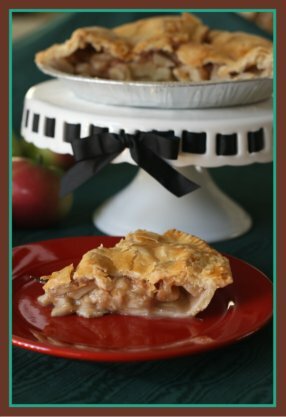 If you are looking for a super tasty apple baking recipe-- you have found the perfect one! You can use almost any type of apple for these apple tarts. 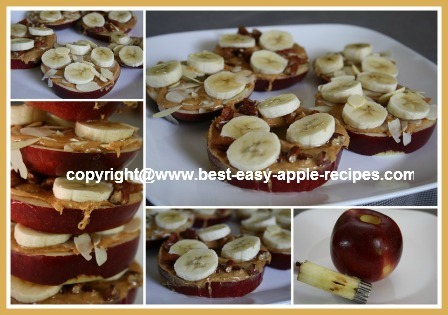 Continue reading "Easy Apple Tart Recipe - Scrumptious Mini Tarts with Fruit"
These Healthy Apple Snacks for Kids are recipe ideas for making fun homemade apple snack treats for children. Continue reading "Apple Snacks for Kids - Recipe Ideas for Making Healthy Treats Fun"
This Apple Cheesecake Bars Recipe is a quick and easy apple recipe using apple pie filling for Thankgiving Holiday Baking or anytime. Baked in a 9" x 13" baking dish. 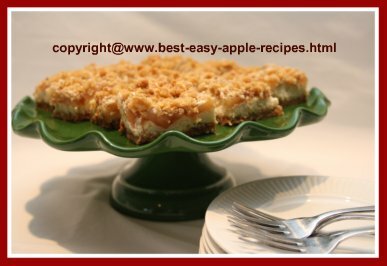 Continue reading "Apple Cheesecake Bars Recipe - Baking Squares with Apple Pie Filling"
I just made this Homemade Apple Cake Recipe (see pictures! 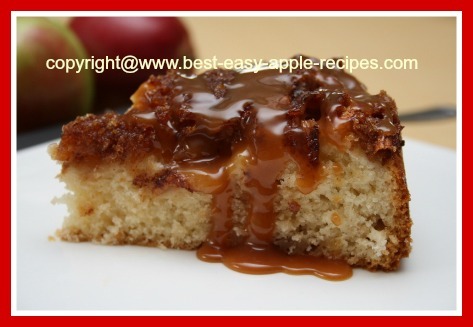 ), with Toffee Sauce; an amazing Cake with Fresh Apples! Continue reading "Homemade Apple Cake Recipe with Toffee Sauce"
Visit the Online Apple Shoppe for where to buy the BEST Applesauce Makers, Food Strainers, Apple Peelers, Kitchen Apple decor and more! 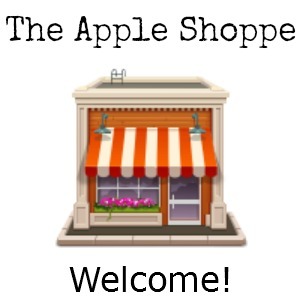 Be sure to visit here for ideas for Apple Themed Kitchens too! 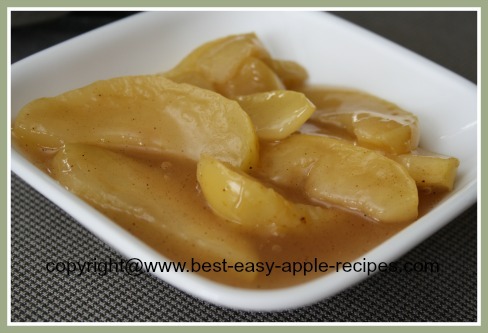 Continue reading "The Apple Shoppe -Where to Buy Applesauce Makers, Peelers, Apple Decor"
Here is a Recipe for Stewed Apples, how to make sliced stewed apples as a side dish or a dessert like the Cracker Barrels's Fried Apples. For Thanksgiving or Christmas Dinner add fresh or frozen cranberries to the apples for a special seasonal apple recipe treat! 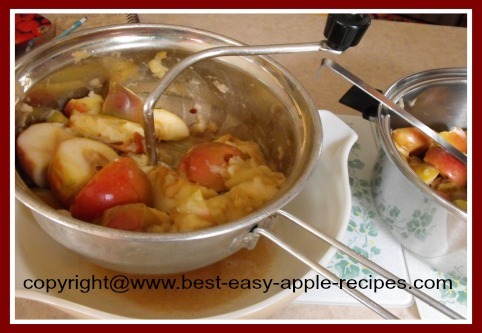 Continue reading "Stewed Apples - Recipe for How to Make Sliced Stewed Apples"
HERE is How to Make Homemade Applesauce using a Foley Food Mill, it is easy and quick to make applesauce at home! If you are planning on freezing or preserving it by canning applesauce this is a great way to make this sauce. Continue reading "Homemade Applesauce Recipe Using a Foley Food Mill "
Freezing Apples with or without sugar is a great idea to preserve apples to use in a apple recipe such as a crumble or an apple pie, at a later time. 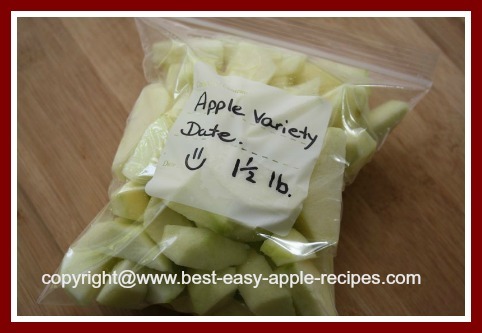 Here are simple directions how to freeze apples with or without syrup! Continue reading "Freezing Apples - Recipe - How to Freeze Apples With or Without Sugar"
This Caramel Apple Cider Cookies Recipe make the perfect Fall /Thanksgiving Cookie Recipe using real caramel candies and Apple Cider Instant Original Drink Mix to make the most yummy apple cookies ever! 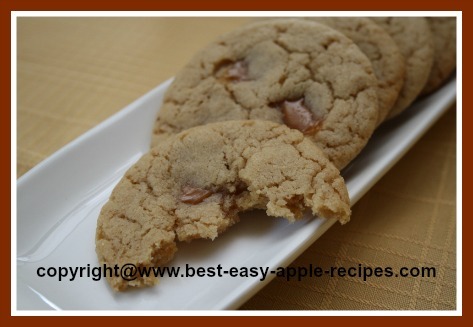 Continue reading "Caramel Apple Cider Cookies Recipe - Fall /Thanksgiving Day Cookies"
These APPLE PIE RECIPES with pictures include the easiest plain homemade apple pie, and mixed fruit pies. 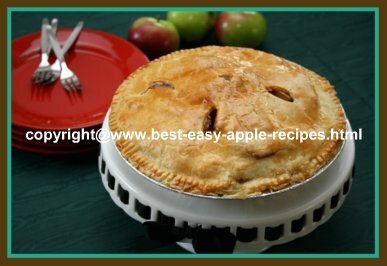 Continue reading "Homemade Apple Pie Recipes for Dessert are the BEST"
This is the EASIEST APPLE PIE EVER, quick and easy, made with two store purchased pie crusts -- and you would not even know the crusts were not homemade! You only need about 8 apples, medium size to make this apple pie recipe. Continue reading "Easiest Apple Pie Recipe Ever- Quick and Easy with Store Bought Crusts"
This Apple Pumpkin Muffin Recipe is made with canned pumpkin puree and apples, a great idea for Homemade Fall Muffins for Thanksgiving! You can substitute canned applesauce for some of the oil ingredient. These muffins are made from scratch and they are AMAZING! 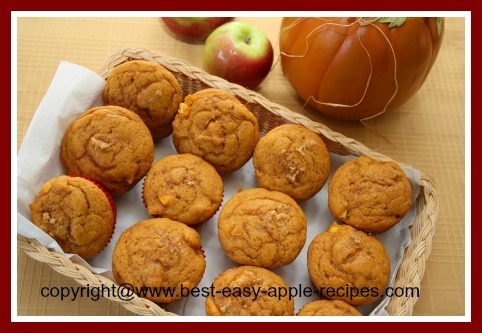 Continue reading "Apple Pumpkin Muffins - Moist Muffin Recipe with Pumpkin Puree"
Make this Peach Apple Sauce Recipe for a healthy homemade fruit sauce as a topping, side dish or to make your own baby food. This sauce recipe is made in the blender and can be made with fresh or frozen apples and fresh or frozen peaches! 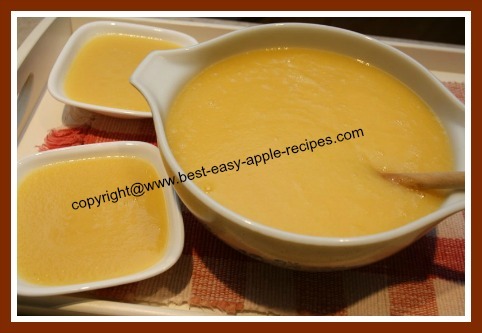 Continue reading "Peach Apple Sauce Recipe - Make Homemade Applesauce with Peaches "
This Apple Crumble Recipe with Oatmeal Topping is our Family Favorite, and it's a quick and easy Apple Dessert Recipe that needs about 8 fresh apples to make! 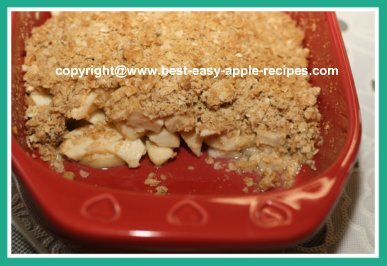 Continue reading "Apple Crumble Recipe - Favourite Apple Dessert With Oatmeal Topping"